Bingham was a passionate advocate of getting people out running. He was fed up with the snobbery that said you were only a runner if you could run fast. He wanted people to run. And he wanted them to know that they were runners. I wonder if we feel the same about being Christian? 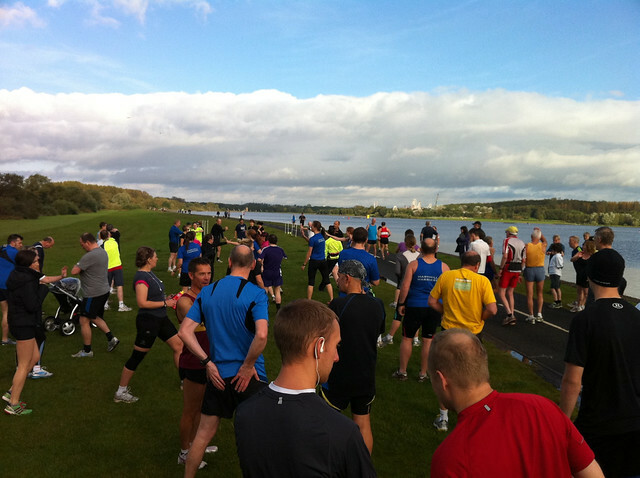 I’ve just realised that I didn’t let you all know how the Parkrun went! As you can see, it was a nice morning for a run, although it had been pretty wet overnight so there were lots of puddles! I usually woudn’t mind the mud but I had on my very white new trainers… not so white now! Anyway, I turned up at Strathclyde Park at 9.25am to find lots of swimmers! That was a shock, but it turned out to be the Great Scottish Swim. Further along the path I found a group of runners of all ages limbering up with varying degrees of enthusiasm. There were people in small groups but lots of people obviously on their own. People smiled, nodded and stood patiently waiting instructions. At the appointed hour the race director called us forward and gave us our instructions… you don’t have right of way and you are running at your own risk! I’ve never run a timed 5k before so I had no idea of pace. I was aiming for somewhere around 25 minutes as 5mins/km is easy to work out! I soon settled down behind a couple of runners who were running a steady pace and followed them round. With 1km to go I went for it… and died a spectacular death with about 400m to go. I really wanted to break 25 mins but there was just nothing in my legs. I finished an agonising 27 seconds outside. When you finish you get a barcode which you take to a table where your personal barcode is scanned along with the time code and that’s it. I was 70th out of 140 people with an age grading of 53.24%. And a PB, obviously! I chatted to the people I’d been following who it turned out were from Glasgow where they usually run the Pollock Parkrun. We shared horror stories about the hill in Pollock Park that was almost the end of me in the half marathon and then I headed home. No pressure to mingle but the chance to if you want. I didn’t go for coffee and cake this time but maybe next time. They read out the times you see… so I’ll need to break 25 mins to earn my cake!